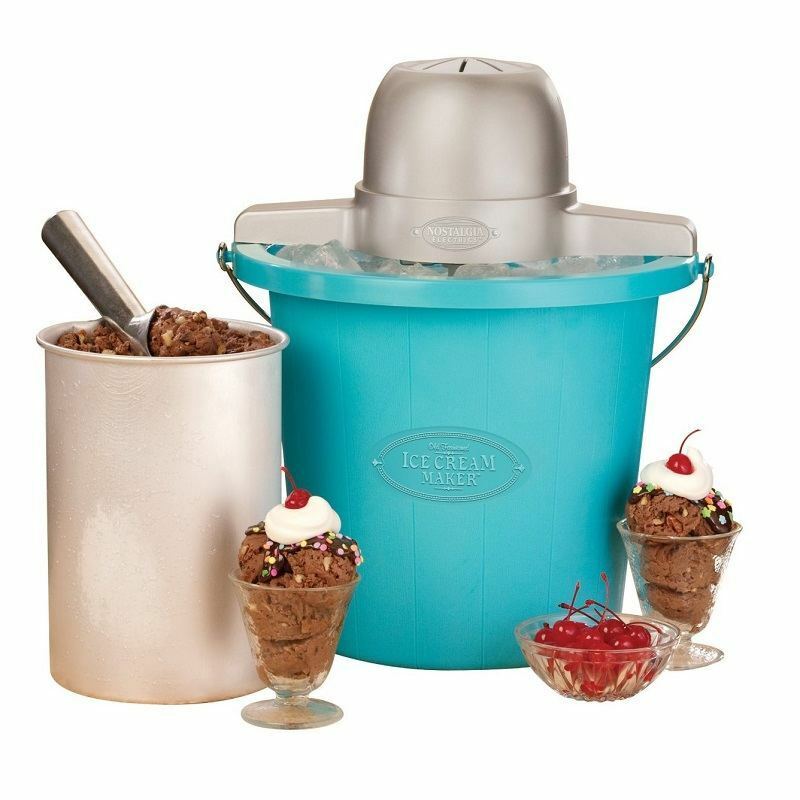 The Nostalgia Ice Cream Maker is perhaps one of the greatest values in home ice cream makers. For under $25 you and your family can enjoy making 4 quarts of ice cream at once with little effort or cost. You can use premade ice cream mixes or create your own. The sturdy plastic bucket doesn’t have the rust problems that metal hardware attached to a wood bucket can. The Nostalgia is easy to operate as well. All you need is ice, salt, and your favorite ice cream mix. This is a great starter ice cream maker and the fact that it actually lasts makes it great for those on a budget that want to be able to offer kids a fun treat experience anytime they want. This is a great choice for small fundraisers for a group. You can earn a lot of funds for a cause with a low upfront cost so there is not really any risk. Ice cream fundraisers are a fun way to raise awareness and bring the community together. Everyone has a lot of fun adding their own toppings and creating different flavor combinations. 4 quarts is a lot of ice cream to make in about 30 minutes. That means in 2 hours you could make an amazing 4 gallons of ice cream or 124 standard ½ cup servings! This maker would be a great inexpensive addition to a birthday party or just anyone that wants a good and delicious way to cool down on a hot day. The cost means it would take only one small gathering for this gem to prove its value and worth. The disadvantages of this ice cream maker is that with the bright blue bucket it looks a lot more modern than some people might like. The canister is aluminum which will not rust but if you don’t like using aluminum for food prep, this could be an issue. The motor is mostly plastic so while customers do marvel at how well it works, the motor is not going to hold up as well over many years of heavy use. At less than $25 though it is hard to complain if you get more than a year out of it. At this price you also are not going to be able to replace parts. The machine can be a little bit messy to operate so be prepared for ice and salt spills. For the creamiest ice cream and faster creaming time you can use heavy cream instead of standard cream or increase the amount of cream used versus milk. Overall this is a perfect ice cream machine for those just getting started making ice cream and don’t want to commit to an expensive appliance just now. For those with kids this could easily pay for itself within two uses with the price of ice cream at a parlor sometimes being $5 or more per treat. Since you can also make frozen yogurt, sorbet, and sherbets, the Nostalgia adds a lot of great new dessert options to your home for an unbelievably low price. Download our FREE e-book and learn all there is about ice-cream makers - Straight to your inbox!